The shredding by means of roller and comb is suitable for the most difficult tasks. Roller teeth made of wear-resistant steel tear the material through the shredding comb. The comb opens automatically if necessary in order to avoid damages by large unshreddable contaminants. All the wear parts are quickly and easily replaceable. The engine and aggragates of the DW shredders are easily accessible from two sides. The powerful direct drive with electric reversing function provides for a high throughput. The self-cleaning cooler is easily accessible and its noise level is very low thanks to the large low-speed fan. 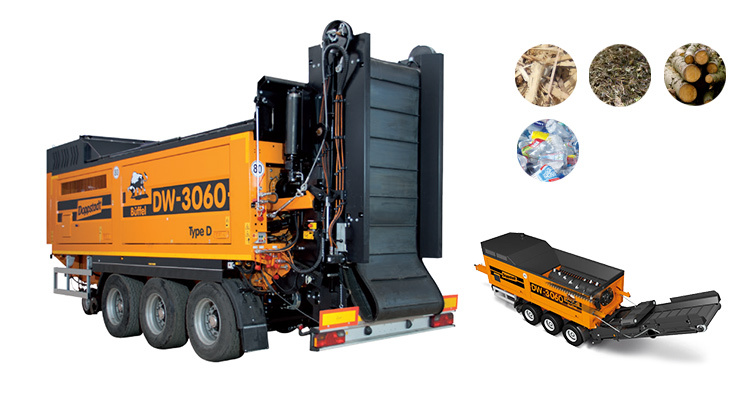 With their rear conveyor, which can be folded out hydraulically, the DW shredders are ready to go in no time. Magnets for iron separation are also available optionally. A multifunctional display shows the machine data and enables a easy machine operation. An optional remote control is available. The roller of the DW 3060 TYPE D has a length of 3 m (9′ 10″) and it rotates at 31 rpm. 21 roller teeth and 22 comb teeth shred the materials.